Halloween has always been one of my favorite holidays. I’ve dressed up on the whole spectrum of costumes from the classics (witch, ghost) to puns (taping two quarters on me to be “50 Cent”) to completely random (an olive… just an olive. Not sure where I came up with that one). We’ve had pumpkins out in my suite since the beginning of the month, and had costumes planned from the beginning of the school year. As college students, you may think we’re pushing the limit of acceptable trick-or-treating age. You’d be right. However, that doesn’t mean we don’t get into the holiday spirit in our own way here on campus. 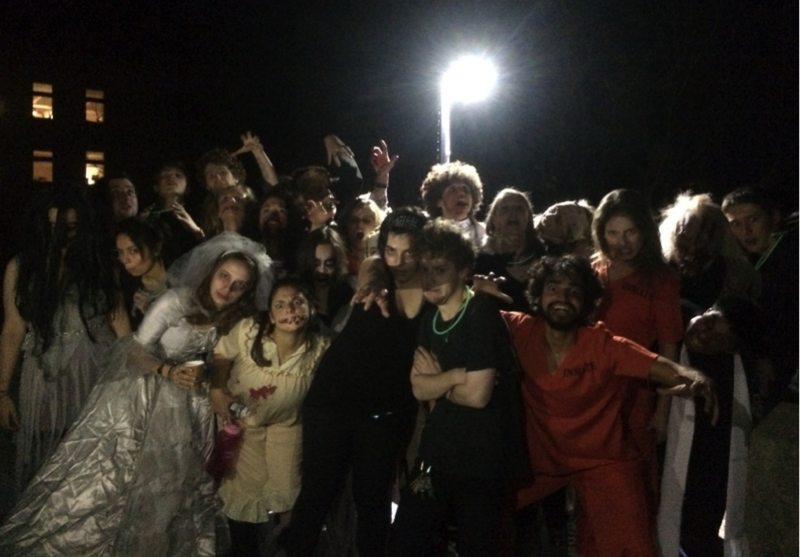 This past weekend, MCAB hosted its very first Haunted House, and I got to be part of it! MCAB is the Middlebury College Activities Board, a student group in charge of organizing fun campus events including concerts, speakers, dances, and themed events like the Haunted House. They’re responsible for bringing performers to campus, which is great because the concerts are affordable and convenient for Middlebury students to attend. In my time here we’ve had some big names like Chance the Rapper, Matt and Kim, T-Pain, Borns, and many more. MCAB is allotted a hefty budge to host these types of events, and as students we get a say in how that money is spent. Any student can submit suggestions for a campus-wide event they’d like to see happen, and this year people showed interest in a Haunted House. MCAB took that idea and ran with it, going all out with spooky decorations and incredible costumes and makeup. It was held in the Bunker, an open performance space that was converted into a dark maze with various themed rooms. They recruited actors and affiliates of the theater department like myself to perform as zombies, mummies, prisoners, ghosts, and other scary figures. I may have gotten a little too into character as a creepy haunted spirit (black and white face paint can do that to you), but we all had so much fun. I guess we all played our parts well, because we managed to make some guys on the baseball team scream like little kids. All my friends who went through the house said they were genuinely terrified, which means the event was a success! I decided to keep my costume on for the rest of the night because at that point I was committed, although I did notice other students keeping their distance from me as we crossed paths. I later realized that the friendly smile I had on just made me look like even more menacing with my blackened eyes and lips and long, ragged dress. Oh well – all in the Halloween spirit! This entry was posted in Uncategorized on November 1, 2016 by Mauli Whitney.